by Christopher Hirsheimer and Peggy Knickerbocker. Peppers are roasting, coffee is brewing, peaches are ripening, tomatoes are practically bursting with flavor...it's another day at the Ferry Plaza Farmer's Market in San Francisco, undeniably one of the best places for fresh produce in the country. Organic fruit and vegetable farmers: fish, meat, and poultry purveyors; cheese makers; artisinal bread bakers; nut and olive oil producers; flower growers; vinegar and jam makers - all assemble under billowing canopies on the edge of a glistening bay. 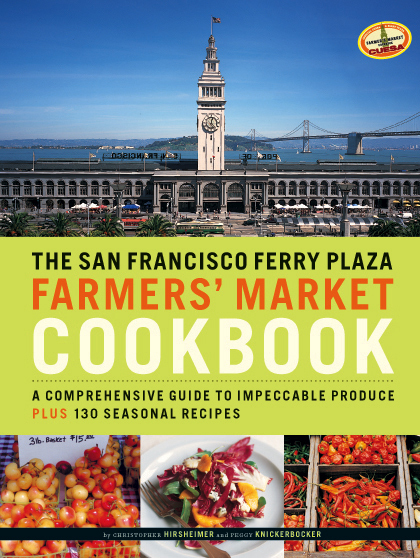 Such is the inspiration for the San Francisco Ferry Plaza Farmers' Market Cookbook. This essential handbook is both a guide for shopping - use it at the Ferry Plaza or whatever farmers' market you visit - and a collection of sensational recipes showcasing this just-picked, inspiring ingredients you'll be bringing back to your kitchen, It's small enough to take with you and big enough to give you all the information you need to select and purchase fresh, sustainably raised fruits and vegetables - and turn them into the most delicious dishes around. Buy the book. "FInally! 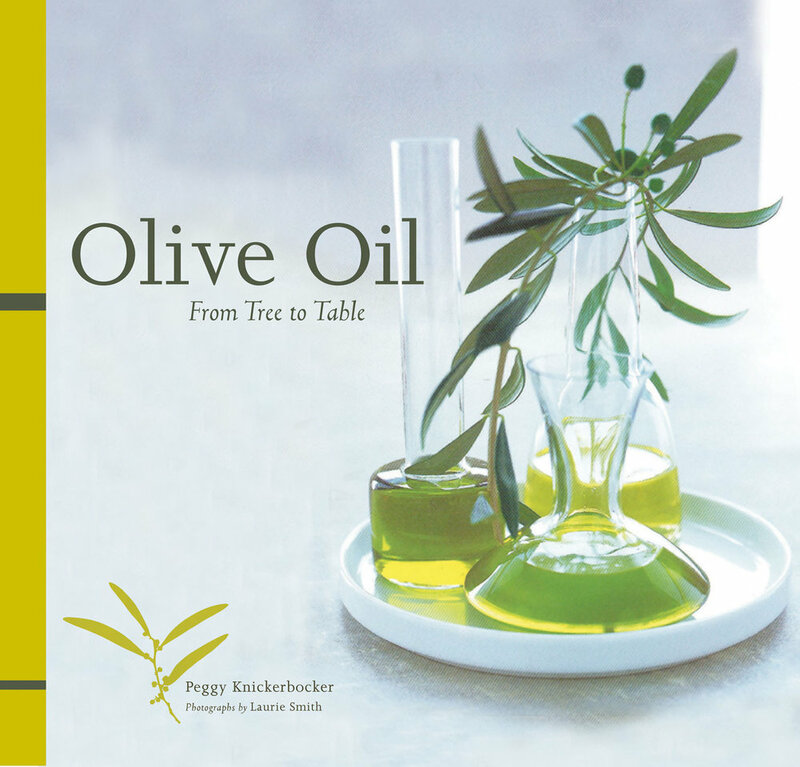 The definitive guide to olive oil - what is is, how to use it, how to cook with it. Written with authority, honesty, and style, and including mouthwatering recipes, this is the book I've been waiting for." This book has gone into multiple printings and is still selling briskly after 21 years. Buy the book. Peggy Knickerbocker lives in two of the greatest food cities in the world, Paris and San Francisco, and she loves to give dinner parties wherever she is. 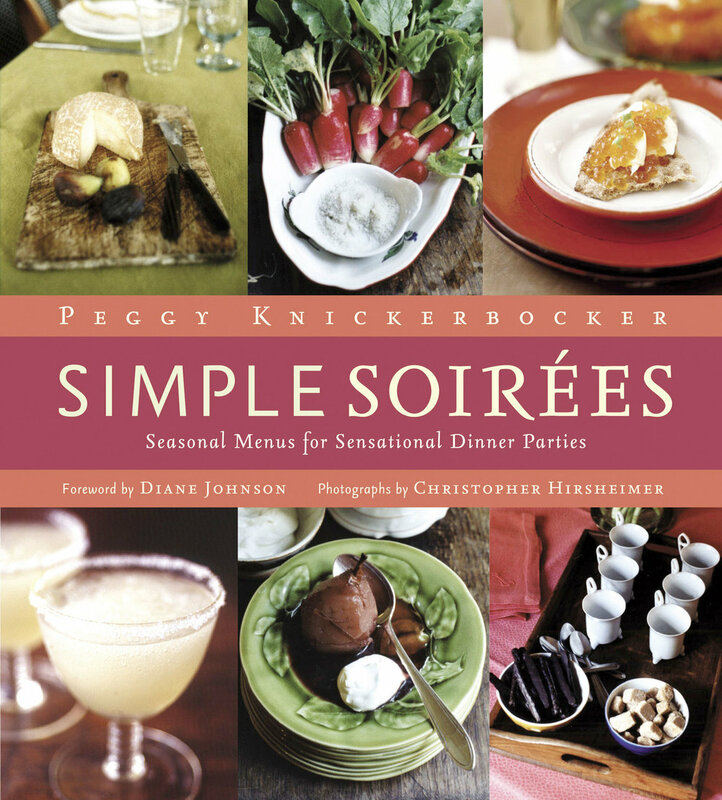 In Simple Soirées: Seasonal Menus for Sensational Dinner Parties, the food journalist, former caterer, and restaurateur shares her passion, her welcoming spirit, and her secrets for creating a memorable party, whether it's a romantic dinner for two, a birthday party for a special friend, or a cocktail fundraiser. The book includes 100 of the author's favorite recipes, organized into seasonal menus such as Warm Figs Wrapped in Serrano Ham, Roasted Salmon with Peas and Mint, and Heirloom Tomato Salad for summer, or Steak au Poivre, Braised Fennel and Garlic, and Double-Ginger Gingerbread for fall. With an emphasis on fresh, local ingredients, the menus are always stylish and often feature an element of surprise. Knickerbocker also offers planning and preparation suggestions, as well as time-saving advice to make entertaining easy and fun. With beautiful photographs that capture the essence of the simple soirée, this delightful book will appeal to food lovers and party lovers alike. When award-winning chef Reed Hearon decided to open his third restaurant in the historic North Beach section of San Francisco, he wanted to pay tribute to the cuisine of the Italian immigrants who settled there. He was immediately intrigued by a hardworking, hard-drinking barkeep named Rose Pistola who had been featured in journalist Peggy Knickerbocker's recently published article on the great cooks, or "Old Stoves," of North Beach. He asked Rose if he could name his new restaurant after her, to which she replied, "What's in it for me?" Reed's answer? A table anytime. The Rose Pistola Cookbook features 140 of this beloved restaurant's best dishes, which combine Old-World Italian spirit and innovative California cuisine. Each recipe has been simplified for the home cook, emphasizing readily available ingredients and straightforward step-by-step instructions. Only the freshest seasonal fruits, vegetables, and seafood are used in ingredient-driven dishes that simply burst with flavor: Shaved Artichokes with Fava Beans and Parmesan. Roasted Beets with Ricotta Salata and Arugula. Wood-Oven Baked Goat Cheese and Roasted Pepper Pizza. Skillet-Roasted Mussels. Crisp Salmon with Fennel and Tapenade. Lamb Shanks with Peas and Potatoes. Rustic Nectarine and Berry Tart. Striking black-and-white photographs of North Beach's farmers, fishermen, and other local residents accompany personal interviews, historical trivia, and colorful anecdotes about this exciting region. 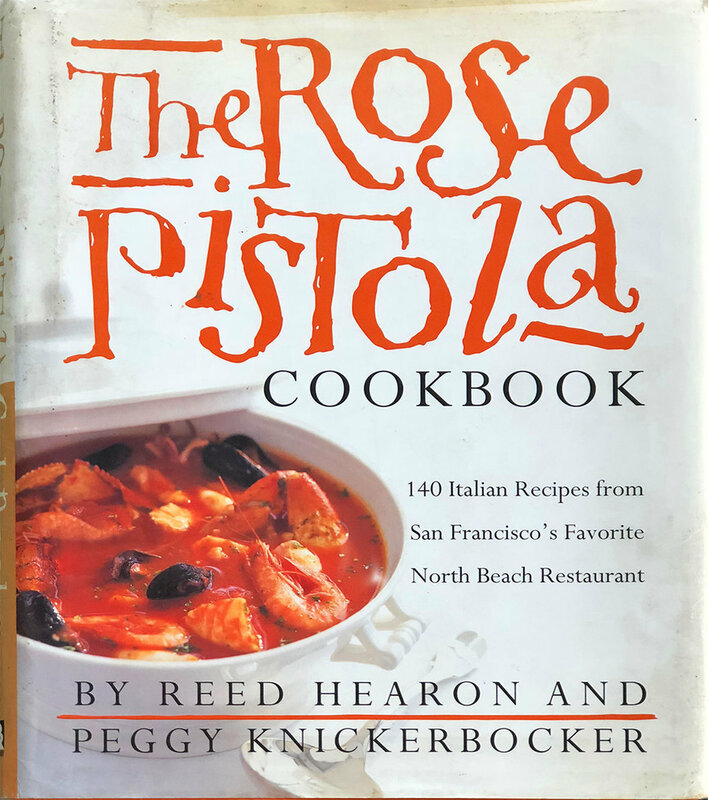 With gorgeous full-color food photographs and detailed information on techniques and ingredients, The Rose Pistola Cookbook brings the evocative flavors of North Beach into your kitchen. Here are a few of my favorite articles over the course of my twenty year food writing career. I was always most interested in the people involved with food, rather than a composed dish. 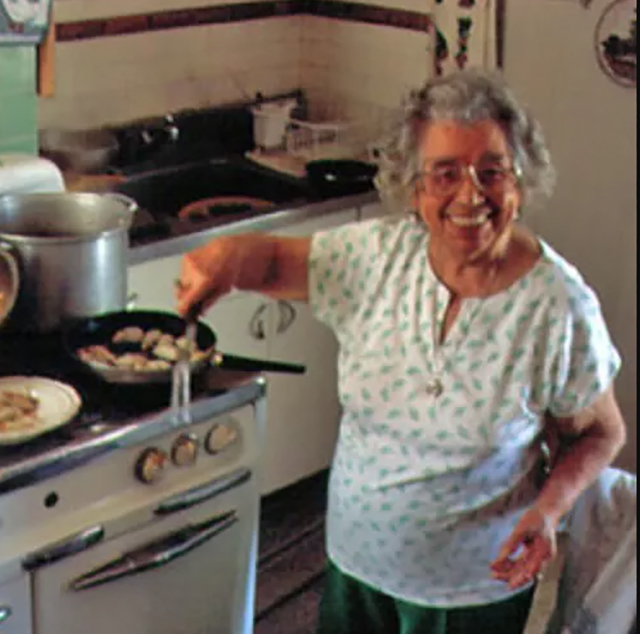 I tended not to write so much of chefs, but rather of home cooks who prepared meals that we could all master. I wrote of raw ingredients, artichokes, Dungeness crab, or of a strawberry farmer from Steinbeck's country, a West Marin cheese maker, a French truffle hunter, a Russian pickler. 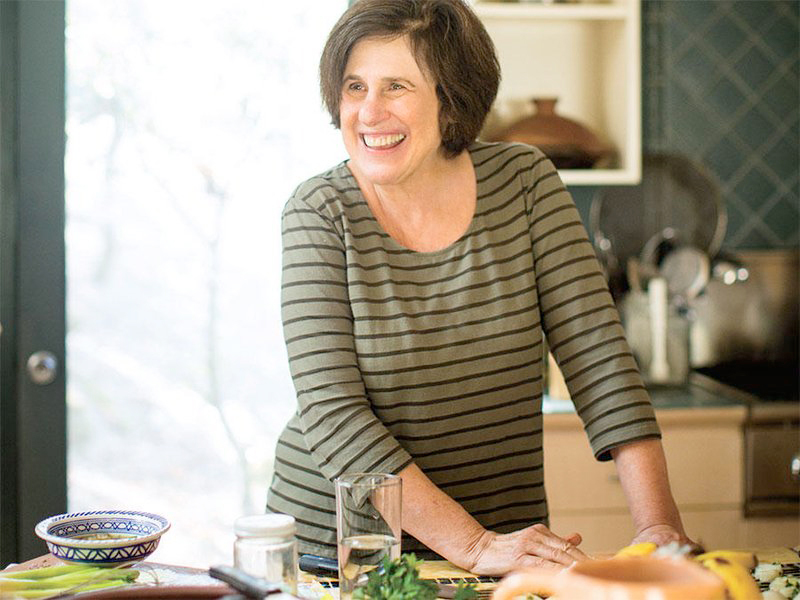 Culinary legend Paula Wolfort fights a spirited battle against Alzheimer's using food, friends, and laughter as medicine. Back home, we became fast friends. From the first time I picked her up to go to a Spanish restaurant on Russian Hill, where we both lived, she was open and funny. I ate her words. I loved her upbeat energy, her inquisitiveness, her immediacy. Read full article. I wake up early, when the cable cars start rolling past my house in North Beach, and amble down the hill to the Dolphin Club at Aquatic Park for a wake-up dip. As I pass through the clubhouse, I see Lou "the Glue" Marcelli in the galley, cleaning calamari for his lunch. Lou, the club custodian, lives upstairs, and cooks for himself every day in this boat-style kitchen overlooking the bay. Today, he'll make himself calamari pasta in red sauce, with plenty of parsley and garlic. It's an old family recipe, he says—the kind of dish the fishermen used to whip up on their boats out in the bay. His father, who immigrated to California in 1914, was one of those fishermen. "During World War II," Lou remembers, "my father fished for shark. Shark's liver was prized by the bomber pilots for improving night vision." As he talks, he slides his knife smoothly along one glistening squid after another, scraping off the skin as he forces out the innards. "It should only take you 15 minutes from start to finish to make this dish," he adds, looking up from his work for a moment, "and that includes cleaning the calamari." Read the full article. There is much to do in Oaxaca, and much to taste. This handsome high-altitude colonial city in the highlands of southcentral Mexico, about 400 miles east of Acapulco and 320 miles south of Mexico City, is the capital of an ancient region, where the rich traditions of the Zapotecs and Mixtecs are jumbled up with the European legacy of the Spanish conquistadors. Archaeological remains, dating back hundreds of years before Christ, ring the city; the famous Zapotec tombs at Monte Alban are six miles to the northwest. The city itself is built around a particularly graceful main plaza or zocalo, where Oaxacans start the day over morning coffee and the crusty oval rolls called bolillos in one of the cafes beneath the porticoes and stately laurel trees that line the square. Two dozen churches serve the spiritual needs of the community, and incidentally offer visitors a crash course in both local and colonial architectural styles and art. There are museums of pre-Columbian and modern Mexican art. The town's premier hotel, El Presidente, is a converted 400-year-old convent, its walls decorated with antique frescoes, its gardens lush with palm trees, bougainvillea, and hibiscus. Italo Calvino describes the hotel evocatively in his sensuous, food-filled story, "Under the Jaguar Sun." 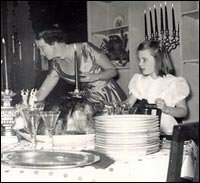 At holiday dinners in our flat on Pacific Avenue in San Francisco in the 1950s, my mother would always start nipping at the bourbon. And with good reason, she'd say. She felt perfectly deserving of the extra, fortifying sip because she had, after all, been preparing the holiday meal, and it had left her fit to be tied. She'd set the table well in advance, with the palest gray damask cloth that matched the trim and ceiling of our Chinese-red dining room. The cloth also matched the gray of our fancy Spode china—which had a tiny red schooner, the same color as the walls, anchored in the middle of each plate. This resolutely red-and-gray dining room was always lit for dinner with dozens of candles. The silver had been polished to a fare-thee-well; the three or four glasses at each place had been rubbed to gleam in the candlelight. At the center of the table was a silvery mirror, placed there to look like an icy pond, around which fragile glass reindeer seemed to stoop for a sip of cold water. Miniature snow-dusted trees stood at the corners of the pond, as a pocket-size St. Nick on ice skates glided across its center, with loden-green elves following close behind. At this kickoff show to Porchlight's 2018 Neighborhood Project, listen to Peggy tell one of many hilarious stories from her four decades in North Beach. Peggy's interview in Untold Tales. THE UNTOLD TALES OF ARMISTEAD MAUPIN examines the life and work of one of the world's most beloved storytellers, following his evolution from a conservative son of the Old South into a gay rights pioneer whose novels have inspired millions to claim their own truth. Watch Peggy's interview clip.